Not long ago I did a couple of posts about Peter Poulton, an artist who has been ranked as one the best pulp illustration artists of the 1950s but is now virtually forgotten. Recently, I started looking into the background and work of another talented artist who provided many great illustrations for men’s pulp adventure magazines but is little-known today — Norman Baer. There’s not much about Baer online or in print. No web pages dedicated to him. Not even thumbnail bios on the few sites that show some examples of his work, like AskART.com. After a lot of searching, I did track down birth and death dates for him on a couple of obituary and genealogy sites. According to the information I found, Norman Baer was born on November 9, 1922 and grew up in Massachusetts. He died on February 14, 2011 at age 88 in Arizona, the state he moved to when he retired. The only in-depth source of background information I could discover about Baer’s life and career is an article published in The Phoenix New Times newspaper in April 2001 about a special exhibition of his illustration art at The West Valley Art Museum in Surprise, Arizona. The article, by journalist Dewey Webb, is extensive and fascinating. It includes many quotes and recollections by the artist about his life, his work and what it was like to be a men’s adventure magazine artist. Norman Baer grew up in Everett, Massachusetts, a suburb of Boston. He was attracted to drama and theatrical visuals from a young age — an interest that was reflected in his artwork years later. He studied art at several prestigious art schools, including the Massachusetts School of Practical Art in Boston, the Rhode Island School of Design and the Brooklyn Museum School. In the early 1950s, Baer moved to New York City, hoping to find a career in advertising art. Like most aspiring illustrators, he also hoped to sell illustration art to top mainstream magazines like THE SATURDAY EVENING POST. Baer was certainly very talented and could create paintings in the same realistic vein as the POST’s most famous cover artist, Norman Rockwell. But he wasn’t able to gain entry into the highly competitive top tier mainstream magazine market or in advertising art. 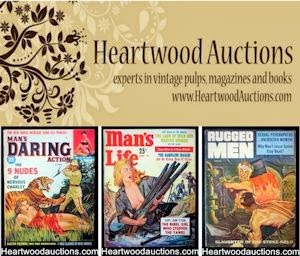 In the mid-1950s, he did start getting illustration assignments from the top tier men’s adventure magazines that had the highest circulations: ARGOSY, CAVALIER, SAGA and TRUE. From then until the early 1960s, Baer created dozens of superb interior illustrations for those magazines, including many for stories by top pulp writers like Mickey Spillane. 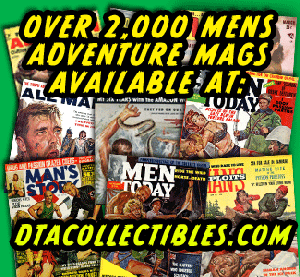 He also did both cover paintings and interior artwork for MEN, one of the great Diamond/Atlas men’s pulp adventure mags published by Martin Goodman’s Magazine Management company. 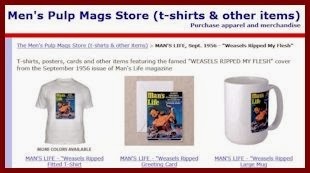 Baer may have done artwork for other Magazine Management periodicals, but I haven’t been able to confirm that so far. He didn’t get as many assignments as the most popular and prolific men’s adventure artists, such as Mort Kunstler or Frank McCarthy. He told the Phoenix New Times reporter that “in a good month” he’d get two or three assignments. Most of them paid a few hundred dollars each and he said he often spent about half of his fees on studio rent, photographers and models. 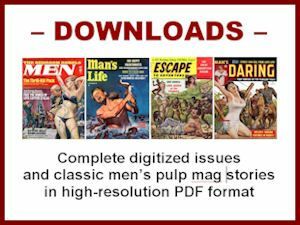 If you’re a men’s pulp mag fan, you know this refers to the favorite male model of many men’s adventure and pulp paperback artists, Steve Holland. 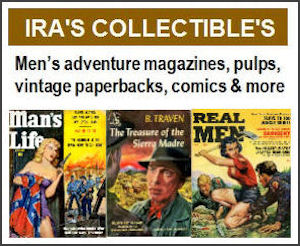 Indeed, Steve’s image often shows up as one or more of the male figures Baer’s men’s adventure mag illustrations. My own favorite example is the black-and-white painting Baer did for the April 1961 issue of CAVALIER. It features Steve Holland as both the priest and the hapless guy being beheaded by a guillotine. “To me, the production — working with the models, assembling the props and costumes — was the most enjoyable part of the whole procedure,” says Baer. Referring to his theatrical flair for composition (portraying a guillotine death in progress, one truly startling illustration's focal point is the victim's screaming mouth), Baer claims that black-and-white film noir of the ‘40s had a big impact on his pulp-era art. During his New York years, Baer’s wife Catherine helped pay their bills by acting in off-Broadway and stock theater productions. They managed to get by, but not much more than that. In 1962, Baer accepted a teaching position back in his home state at The Art Institute of Boston, which provided a better, more dependable income. At that point, his run as a men’s adventure magazine artist came to an end. Baer was apparently a popular instructor at Boston’s Art Institute. Some of the students he taught who went on to become successful artists proudly note in their bios that they studied under Baer. Artists such as Larry Blamire, T.A. Charron and John Kilroy. Once Baer moved to Boston, he finally broke into the advertising art market he had originally aspired to. He also did storyboards for television commercials. It doesn’t say it was for her health. But she died first, sometime before the 2001 gallery show the article mentions. I couldn’t find any examples of his later work online, but I found quite a few examples of his men’s adventure artwork in my collection. My fellow illustration art aficionado Thomas Clement (who maintains the excellent American Art Archives website and is one of the best sellers of vintage magazines on eBay) also sent me a batch of his own scans of artwork by Norman Baer. Some are featured in this post. In the next post, I’ll show more and discuss how I was able to ID some of the uncredited MEN cover paintings Baer created thanks to another illustration art buff who is a regular visitor in the Facebook group associated with this blog.